At the beginning of the spring semester my roommate and I began thinking about what we were going to do for Spring Break. Last semester we had gone hiking in Zion National Park, Utah, but we did not get to go on all the hikes we wanted, so we decided we would go back. This park is known for its red rock, the amazing hiking experiences, rock climbing, and the photography opportunities it provides. My roommate and I set out on our hike at 8 o’clock in the morning. The sun was just starting to climb over the horizon and was bathing the landscape in light. This was one of the more strenuous hikes as we had to scramble over rocks, wade through water, and climb up slippery, moss covered rocks. We hiked The Subway for three hours before reaching the end. The hike became visually appealing as we approached the end. We stopped many times on the way to take pictures, but what I was most excited for was the end of the hike. We had reached the end before the sun was fully over the mountain. My roommate and I hiked into The Subway and were taken aback by the beauty. It was amazing thinking about how it all formed. It was very slippery due to the water and the moss covered ground. 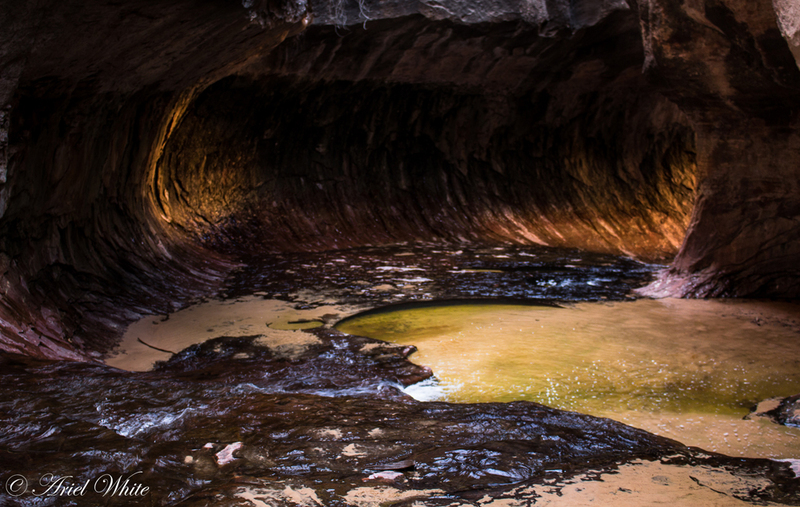 Many holes had formed inside allowing pools to swirl and to flow and to make for a breathtaking experience. I took a few photographs from inside as I knew it would be impossible to explain to people how amazing this was. All the photos I took were handheld as I did not have a tripod with me. If I had one I am sure I would have captured even more incredible photographs. When I took the photo I wanted it to show the beauty of nature. I wanted people to know that sometimes you have to go out of your way to capture something great. I believe this photo encapsulates that perfectly. I took this photo with my Canon Rebel EOS T5i, with the 18-55mm kit lens. The focal length was at 30mm with an aperture of f/4.0. ISO was set to 400. I had the shutter speed at 1/25 as I wanted to capture the motion of the water and make it look a little like mist. There was some post processing involved. I lowered the exposure on the rocks and upped the contrast to bring out the formations. This also brought out the water pool and the light coming in through the tunnel. I saturated the green in the pool to make it stand out and also saturated the light in the tunnel to show how it shined through. I cropped very little on the top so as to not detract from the photo. I am very pleased with the final result. My name is Ariel White and I am a senior at Northern Arizona University. I will be graduating with a major in Electronic Media and Film (renamed to Creative Media and Film) and a minor in Photography. I chose Photography as my minor because I felt it went hand in hand with my major. Coming up with visually captivating photographs would work almost exactly for setting up scenes for a TV show or film. I had always been interested in photography, but I never had the means nor the money to let my interest grow until Spring of 2014. Once that camera was in my hands I knew it was something I would use throughout my life.